Soto Micro Regulator Stove – Flames in the Cold! 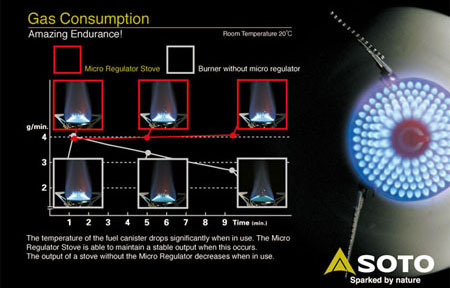 The Soto Micro Regulator Stove is designed to maintain a consistent and stable flame output for cold weather performance. Designed with a proprietary “stealth igniter” installed inside the burner post to help improve ignition and prevent breakage this ultralight stove weighs 2.6 oz (73g) and the “Hyper surface Burner Head” efficiently heats your cookware. This Backpacker Editor’s Choice ultralight stove keeps burning in the cold. Get yours at MPGear. Hello! So sorry about the late reply! You can quote whatever material from our blog that you’d like. Just be sure to link it back to us 🙂 Cheers! « Nemo Losi 3P, Opsrey Atmos 65 & MSR Fuel bottle – Winners!